News apps and RSS readers are a dime a dozen. While the content and interface can vary from app to app, the basics are essentially the same. You choose your news sources and interesting topics, and let the app pull articles it thinks you'll like and display them in a phone-friendly format. It's a great way to get a list of articles that you'll (hopefully) be interested in each morning. But if we want to find out what articles our friends like, we have to go to Facebook, twitter, or go through our email for those rare "FWD" emails that don't include pictures of funny cat faces. 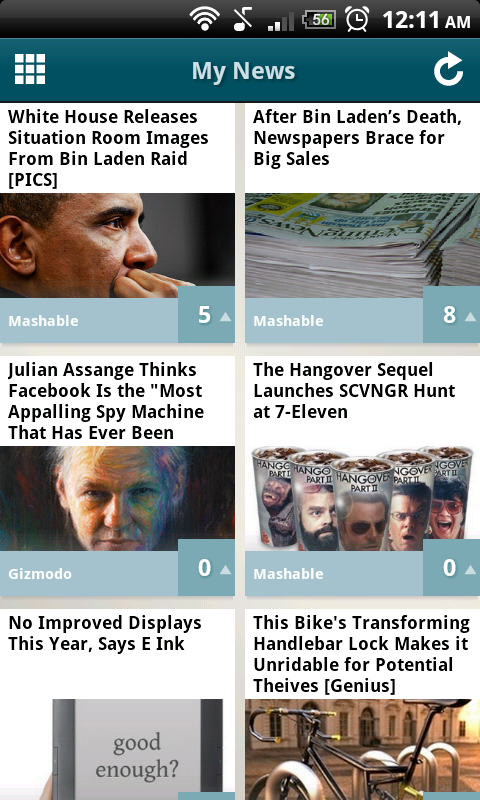 Ninua is a new Android application that hopes to make your daily news stream more social. While the app still has a few rough edges, it's now my go to news source on my phone. Full impressions after the break. Ninua is a mobile extension of the popular Facebook news service “Networked Blogs,” which allows users to read, comment, and share articles from your favorite blogs. Networked Blogs boasts over one million active users and seven hundred thousand registered blogs, and Ninua gives you access to that network directly on your phone. Signing into the application is simple. Because of the integration with Networked Blogs, Ninua uses your Facebook login to set you up with an account. This is how some apps like to trick you into spamming your friends about finding lost cows, but Ninua hasn't posted a single item on my wall in the past two weeks I've used it, which is how it should be. Ninua will let you select sources in three different ways. You can follow blogs the traditional way, by finding a topic you’re interested in and following blogs that are found under it. The interface here is very similar to what you would find in Pulse or a similar reader. But Ninua also will give you the option to follow blogs written by your facebook friends (If they linked them to the Networked Blogs network) or follow blogs that they follow. You can also choose to follow your friends who use the app (or Networked Blogs), which makes sharing stories much easier. Once your sources are selected, the top stories from those sources are displayed in your news feed. When you select an article you want to read, it’s formatted for your phone and you get the traditional options to view the article on the website, view more from the source (blog), or share (send via Twitter, Facebook, etc). The social aspect of the applications comes from the last option, which is the "up" button. 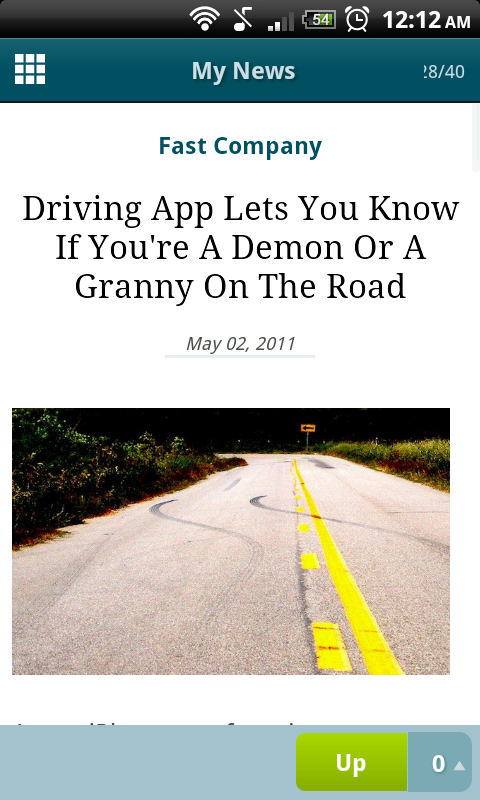 The "up" button acts like the "like feature on Facebook, and the app uses an articles popularity in some interesting ways. When Ninua refreshes your top stories, it will prioritize articles that other’s have liked, so popular stories will be towards the top of your feed. The really cool feature though is how it deals with your friends recommendations. If one of your friends "Up's" an article, even from a blog you don't follow, it will appear in your top stories. In my testing, I found that an article typically had to have more than one of my friends like it before it appeared in my timeline, but you may not want to "friend" everyone in this app you can unless you want to have your timeline flooded with celebrity gossip. The interface is well laid out, giving you the information you're looking for without overloading your screen. But the social aspect of the application is what makes it unique. The ranking system works really well, and it was interesting to see the types of articles my friends liked popping up in my timeline (and they were usually relevant to my interests). The only real issue I had was following specific people from within the app. If they're also using Ninua, it will give you the option to follow them in the app, but if they're using Networked Blogs on Facebook, it's difficult to follow them. I mentioned my frustration with this on twitter a few days after I installed the device, and was surprised when a member of the development team (Tara Kelly, User Experience Designer) responded to me directly. She said that the "friend" feature isn't fully implemented yet because the team is in the process of upgrading the Networked Blogs application to fully integrate with Ninua. She said that the important thing for their team was getting the application out to the public to make sure the core of the app worked before they added more to it. I was really impressed with how quickly Tara Kelly responded to my initial tweet and to the feedback I emailed her. I already enjoyed the app, but discovering that the team (or at least the UX designer) was actively listening to the community for feedback made me want to share it with you. Quality applications and responsive developers are two things we need more of in the Android market, and Ninua provides both. It's my go to news browser, maybe it will become yours as well.